Montage - Une anthologie (1913-2018) is a recently published, monumental collection of texts dedicated to film editing from the beginning of the twentieth century until today. 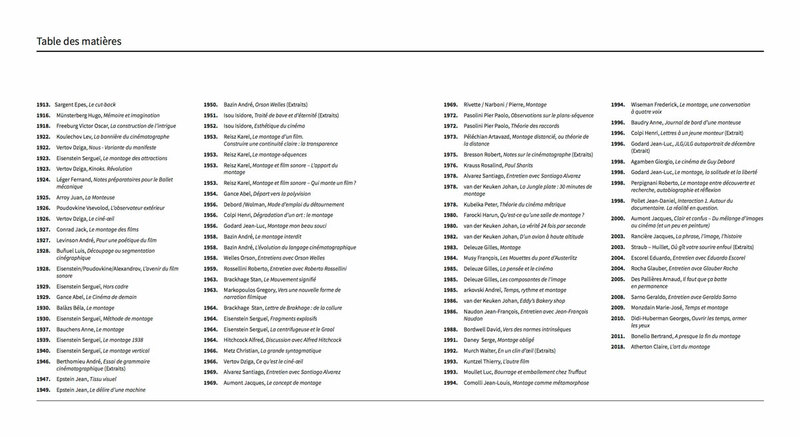 The 94 texts, all introduced and annotated, are divided between ‘source’ texts, mainly by filmmakers (in the form of a manifesto, article, talk or interview), and ‘reference’ texts by theoreticians and critics. The anthology includes texts by Isidore Isou, Debord, Godard, Welles, Rossellini, Brakhage, Markopoulos, Rivette, Pasolini, Artavazd Pelechian, Bresson, Van der Keuken, Farocki, Deleuze, Daney, Agamben, Rancière, Straub & Huillet, Georges Didi-Huberman, Claire Atherton, Frederick Wiseman, Jean-Daniel Pollet, Glauber Rocha, Alvarez Santiago and others. You can consult the complete table of contents here and read the introduction here. A networked structure of key terms connects the texts and allows the reader to make his or her own wanderings and discoveries. The term ‘interval’, for example, can make one travel from Vertov to Rancière, passing by Deleuze. The book cover is made up of the dynamic structure of Johan van der Keuken's Big Ben: Ben Webster in Europe (1967). Last month, Éditions Amsterdam/Les Prairies Ordinaires published Godard, inventions d'un cinema politique 1966-1973, the first detailed study of a longtime neglected and slandered period in the work of Jean-Luc Godard. Keeping away from a biographical approach, David Faroult adresses and historizes each of the films of Godard's militant period (before and after the Dziga Vertov Group). The last part of the book, ‘Annexes’, offers a large collection of archive materials, working documents for the films, transcriptions and translations, a cahier with photographs and unpublished interviews. In October, Éditions Macula also published Cinéma absolu. Avant-garde 1920-1930. Of all the artistic avant-gardes, the least well known area is cinema and its cubist, constructivist, futurist, dadaist, abstract, surrealist, ... experiments. Patrick de Haas traces the singular trajectories that in the 1920s led a group of artists from different disciplines to the cinema: not only those who made films such as Richter, Len Lye, Duchamp, Léger, Picabia or Moholy-Nagy, but also the collaborators who were poets (Artaud, Mayakovsky, Desnos, Tzara, ...), painters (Malevich, Van Doesburg, Rodtchenko, Magritte, ...), musicians, dancers and architects. Cinéma absolu. Avant-garde 1920-1930 is a new landmark study on these films, experiments and the aesthetic debates of the time. In the first half of November, the same publishing house releases André Bazin, Écrits complets. This deluxe three-volume collection for the first time gathers all of Bazin's writings (about 3000 texts) of which only a fraction had been available to date. An impressive index lists all of the film titles and names of filmmakers. No better way to celebrate Bazin's centenary year. You can read the elaborate press kit with excerpts here. At the beginning of November, De L'incidence Editeur publishes two new books. Jean-Claude Biette. Appunti et contrappunti is the first collection of texts on the figure and work of Jean-Claude Biette. The texts look at his relations with Serge Daney, Pier Paolo Pasolini, Éric Rohmer, Danièle Huillet & Jean-Marie Straub and the cinema of Jacques Tourneur. Biette (1942-2003) was a filmmaker, co-founder of the magazine Trafic, film critic and theoretician (Poétique des auteurs, 1988; Qu’est-ce qu’un cinéaste?, 2000). On 9 November, the same publisher released the first book-length essay of Olivier Cheval, who's a critic for the magazines Trafic and Débordements. 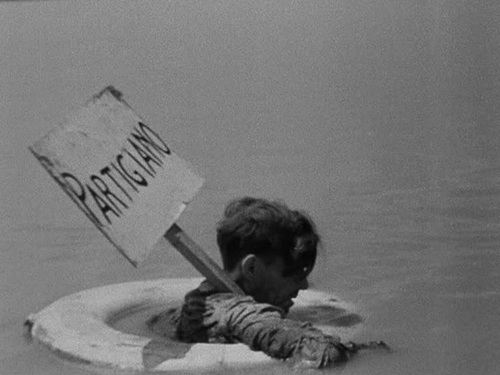 In Le Partage de la Douleur - Une Impolitique du Film, Cheval thinks of film as a place where our powers to suffer and our powers to share form a promise of justice and commonality. Relying on the work of Eisenstein, Godard, Pedro Costa, Béla Tarr, João Pedro Rodrigues, Tsai Ming-liang, Apichatpong Weerasethakul and Gus Van Sant, he suggests how film today designates what is possible and impossible; what is, shouldn't be or demands to become. On November 11, Metahaven will launch their new book, Digital Tarkovsky, at ICA London. This book-length essay, published by Strelka Press, is an extended poetic exploration of how our experiences of visual entertainment and time itself are changing in the era of smartphones and near-constant connection. The title is derived from the fact that in the U.S., an adult on average spends two hours and 51 minutes on their smartphone every day, which is eight minutes longer than Andrei Tarkovsky's film Stalker. Digital Tarkovsky is a way of tracing what cinema, storytelling and time mean in our platform-based world. 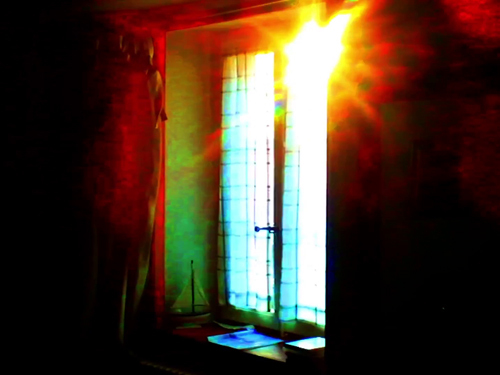 The work of Metahaven consists of filmmaking, writing, design, and installations. On 15 November, K-punk: The Collected and Unpublished Writings of Mark Fisher (2004-2016) will be out via Repeater Books, the publishing house Fisher cofounded. This 500-page anthology brings together the best work of acclaimed blogger, writer, publisher, political activist and lecturer Mark Fisher (aka k-punk) who died in 2017. It collects his (unpublished) writings on politics, activism, precarity, hauntology, mental health and popular modernism, including a selection of his insightful film and television reviews. On Sabzian, you can read the Dutch translation of Fisher's reflection on Alfonso Cuaróns Children of Men (2006) which constituted the first chapter of his book Capitalist Realism (2009). On 16 November, Filigranes Éditions publishes Pascale Ogier - Ma Soeur, a tribute book by her half-sister Emeraude Nicolas, containing unpublished photographs, post cards and letters written by Ogier and testimonies by intimates (Jim Jarmusch, Olivier Assayas and Marguerite Duras among others). 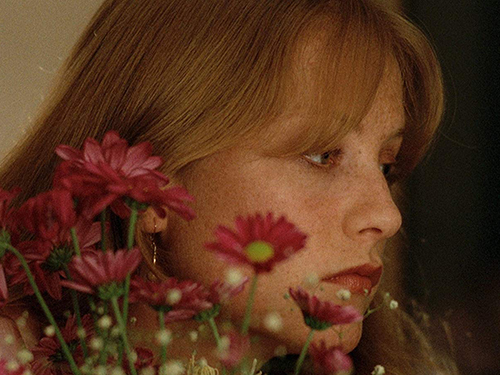 Pascale Ogier was the daughter of actress Bulle Ogier and a unique talent best known for her collaborations with Jacques Rivette (Le pont du Nord) and Éric Rohmer (Perceval le Gallois, Les nuits de la pleine lune), but she passed away in 1984 on the day before her 26th birthday.